Prince Charles is living his life like your average Disney character. In a new issue of Country Lifemagazine, which Charles guest-edited in honor of his 70th birthday, his son Prince William opens up about his father, explaining that he's very fond of squirrels — so much so that he feeds them, names them, and has allowed them to roam freely around his estate. What an inspiration! "He is completely infatuated by the red squirrels that live around the [Birkhall] estate in Scotland — to the extent that he's given them names and is allowing them into the house," William told the magazine. Given that Prince Charles is a patron of The Red Squirrel Survival Trust, none of this sounds at all surprising. 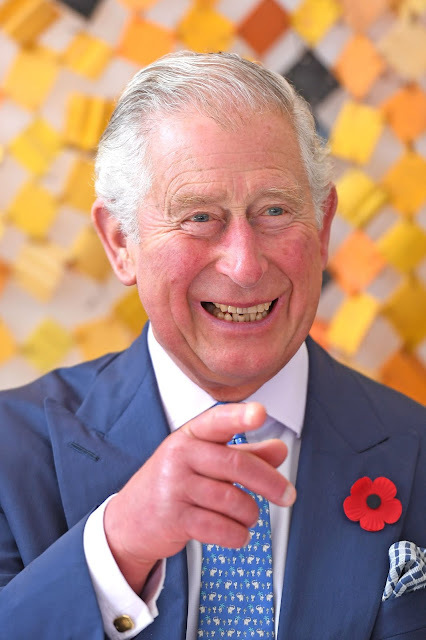 "They come into the house at Birkhall and we get them chasing each other round and round inside," Charles told Country Life. "If I sit there quietly, they will do so around me. Sometimes, when I leave my jackets on a chair with nuts in the pockets, I see them with their tails sticking out, as they hunt for nuts — they are incredibly special creatures." Squirrels aren't the only creatures that Prince Charles regularly encounters. He's been photographed with all kinds of animals, from piglets and baby goats to a bald eagle. So, at least we know where the rest of the family gets it from.